Classic rock and roll filled the air in Simpsonville, SC – just outside of the Greenville, SC metro area – on Friday night at the Charter Spectrum Amphitheatre. 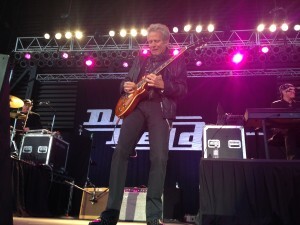 Former Eagles lead guitarist Don Felder and the Doobie Brothers brought a fun, rocking show to town. Throughout his set, fans would walk to the very edge of the stage and have their picture taken with Felder riffing away in the background. A lady even threw a South Carolina Gamecocks t-shirt up onstage. Felder picked it up and said, “Now we are in Gamecocks country, aren’t we?” and the crowd erupted – with a few jeers from Clemson fans. A talk box was brought out for the hard-rocking “Those Shoes.” Then, with an acoustic guitar in hand, Felder strummed the chords for “Seven Bridges Road” – made famous by the Eagles from their 1980 live album. Felder and his band harmonized the song very well. Before performing “The Long Run,” Felder invited everyone down to the open area just beneath the stage to dance since he called it “a dancing song.” The fans flooded the floor and danced the night away while Felder played the song’s signature slide riff. They closed out the set with “Heartache Tonight” and “Life In The Fast Lane.” Felder and the band exited the stage and the lights dimmed. It was time for the encore, and everyone knew what song was next. Felder and the band came back onstage to a thunderous applause. The guitar tech handed Felder his signature white double-neck guitar. Felder also welcomed Doobie Brothers guitarist John McFee as a guest for the epic “Hotel California.” Felder began the slow 12-string guitar part, which added to the song’s mystique. Towards the end, Felder and McFee both played the dueling guitars solos to perfection. Felder could have easily put on a two-hour show but was just limited to an hour. He proved that he didn’t need the “Beagles” or “Seagulls” for this former Eagle to soar. 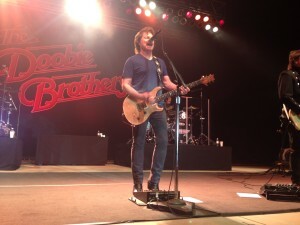 The timeless Doobie Brothers went on last to a packed ampitheatre of eager fans. 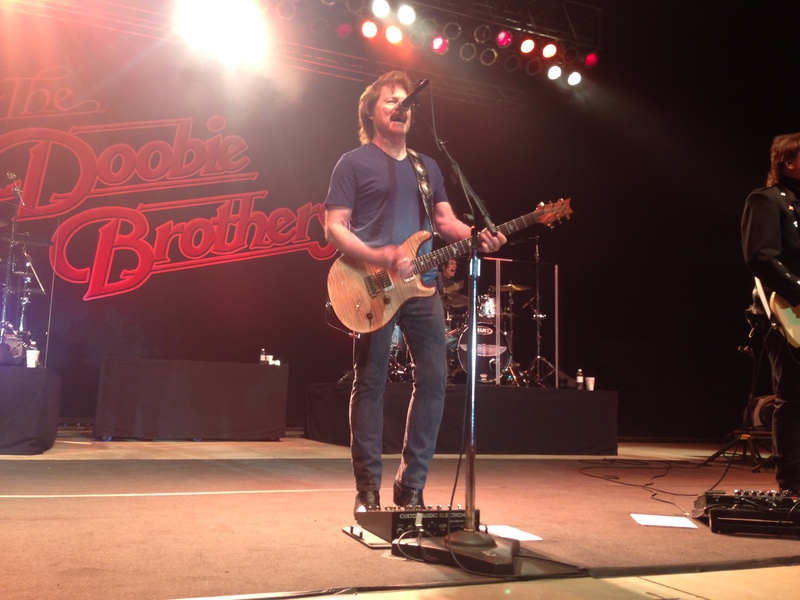 The chilly evening was eventually warmed up by the energy of the Doobie Brothers, who were anchored by longtime members Tom Johnston, Patrick Simmons and the aforementioned McFee. They started with the soulful “Jesus Is Just Alright” and then the get-your-motor-running “Rockin’ Down The Highway.” Simmons motioned to the congregation to come on down, and they once again flooded the pit area. They featured “World Gone Crazy” from the 2010 album also titled “World Gone Crazy.” It featured an extended intro by keyboardist Guy Allison and the gospel vocal intro by bassist John Cowan. Later on, Simmons said he was getting ready to play some “hippie/redneck music” with McFee on pedal steel guitar. They then cranked out the southern influenced “Neal’s Fandango.” McFee stayed in that position for the next song too, “South City Midnight Lady.” Sax player Marc Russo also got a chance to solo, which he did on various songs throughout the night. The funky “Eye’s Of Silver” made a return to their setlist, which was a pleasant surprise. Johnston stepped off into the shadows for a break during “Don’t Start Me Talkin’” and could be seen still playing guitar along with the song. That showed just how much dedication and love Johnston has towards the music. They closed their main set off with the radio anthems “Back Water” and “Long Train Runnin’,” where the versatile McFee also played harmonica. It’s like the Doobie Brothers get better with time – kind of like wine. Well, they are from wine country, and their manager, Bruce Cohn, owns the B.R. Cohn Winery. So it kind of makes sense. 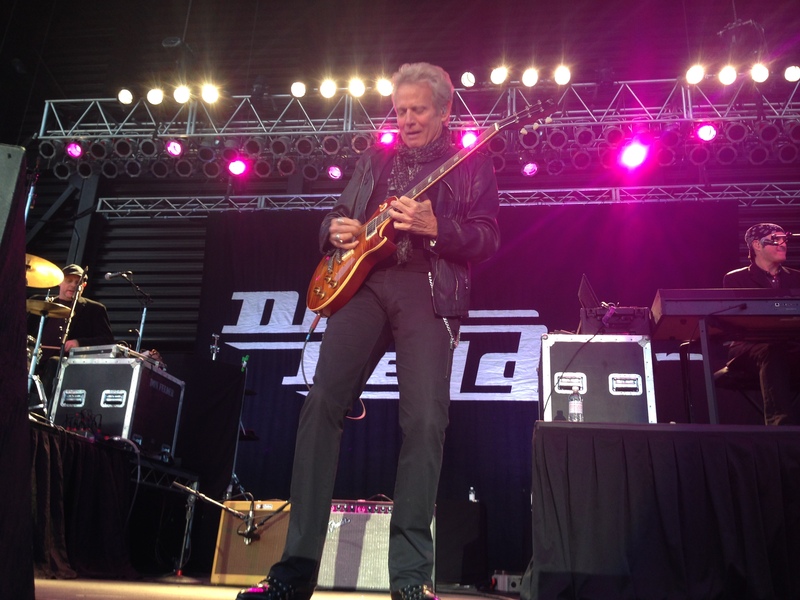 The Doobie Brothers and Don Felder put on a great show to kick off the concert season in Simpsonville. This was the first event at the amphitheatre for its new management, TRZ of Anderson, SC. They have a promising summer full of shows lined up already. Hopefully they will keep bringing these class acts into town.